1. Google before you go. Before leaving home, find out where the closest grocery stores are from where you’ll be staying. If you’ll be staying in a hotel, you may want to check in and then head to the grocery store for some healthy late night snacks. If you love farmers markets, you should also do a search on farmers markets in the area. 2. If you will be road tripping to your destination, you will want to load the cooler with healthy snacks and drinks: fruits, granola, chopped raw vegetables, yogurt, water, etc. 3. If you’re traveling with a group of people, you may want to share meals: order family-style or split an entrée with someone in your group. 4. Choose restaurants that serve local produce. Local produce offers higher nutritional content than produce that has been shipped across the country or globe. 5. Don’t forget to eat breakfast! 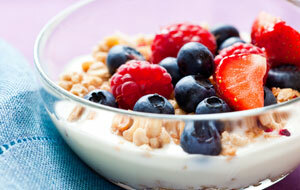 Eating a reasonable breakfast will provide your body with fuel to help you stay energized throughout the morning. 6. Eat in moderation. It’s near impossible to eat healthy the entire time while on vacation, so when you do splurge, be aware of how much you’re actually eating.